Language is magic. It allows us to communicate the intangible as well as the concrete; to relate history, invent story, and blend both into the sometimes maddening mix called legend. 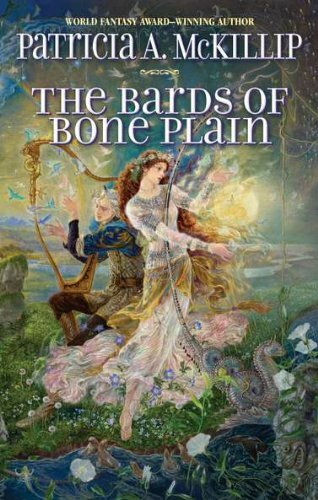 His topic is Bone Plain and its mysterious standing stones, where centuries ago the infamous bard Nairn the Wanderer—the Fool, the Cursed, the Unforgiven—failed the Three Trials and was lost forever. No direct record exists of what the trials exactly were, nothing but their names. Phelan’s counting on there being no secrets to discover. Then an archaeological expedition in the area turns up a curious disk with an oddly familiar profile on one side, and twig-like designs on the other, much like the patterns on the standing stones. If the designs are writing, what do they mean? And what happened to the people who used that language? The more Phelan learns, the more certain he is that the legend of Nairn is much more than an old story. Even more maddening, events seem to be circling back, history ready to repeat itself, as the king announces a competition to choose a new royal bard, bringing musicians from across the land to out-sing, out-riddle, and out-puzzle each other. But the prize may demand much more of the winner than any seat at the king’s side.